I love doing these Beer Brawls™; where else am I going to sit down with a bunch of beer geeks and drink 9 different beers feremented with brettanomyces yeast. 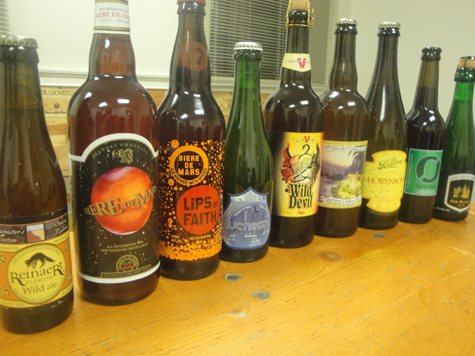 This beer brawl brings us back out to the Liquor Outlet in Boonton New Jersey where we met up with Kevin and Russ to explore some wild beers. Joining me on this podcast was Kevin and Russ from the Liquor Outlet in Boonton NJ. The only prerequisite I have for the Beer Brawl™ is a love of beer. You don’t need to know anything about the beers we are drinking only a willingness to try them and voice an opinion. 3.1% abv beer made with both Lactobacillus and brettanomyces yeast. We found this to be a very good summer beer. A cloudy sourdough smelling beer, very smooth lemony beer that was moderately tart, maybe 4 on a scale of 10. A 100% Brettanomyces fermented IPA. This 6.7% abv that typifies what a Brett IPA should be, lots of American IPA fragrance and flavor with the funkiness associated with the Brettanomyces yeast. All the Jolly Pumpkin beers I’ve had previously have always solid and very unique. We were not let down with this 8%abv beer Franco-Belgian strong golden ale fermented with wild yeast. Had a great peppery lemon citrus aroma with a big bold flavor to go with the aroma. As a beer we couldn’t get at the Liqour Outlet because New Belgium doesn’t distribute to NJ, I was particularly looking forward to this beer, but it really didn’t live up to my expectations. While a good beer, nice spice aroma, but not much funk for a beer bottle conditioned with Brettanomyces. 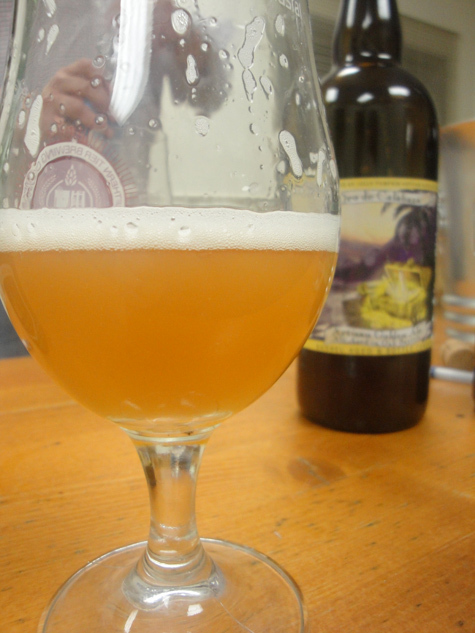 This 9% abv beer was fermented with 2 different yeasts including brettanomyces. This beer a fruity funk on the nose and had very complex funky, spicy, peppery, earthy flavor. All jokes aside with the name, this 8% wild cranberry beer that Mikkeller had a hand in creating, was very in your face with teh sour aroma. Which we loved! It was a intense bold beer that I’ll look forward to drinking again in the future. The Duchessic is a blend of Birra del Borgo saison and a 1 year old Cantillon Lambic. Right away you could smell the Cantillon, very sour nose with a sourdough oaky flavor. A nice beer, that also had the reseal cap. The final beer of the night and boy did this little 375ml bottle deliver. Big sour beer, 8 of 10 on my sour scale. By far the best beer of the night for us sour beer lovers! I’m working on future Beer Brawls™, we have a Session, High Octane, Dogfish Head, and Porter Beer Brawls™ coming up. We’d also love to hear your suggestions!